My great-grandparents came from Kerala, India and settled in Malaya (today Malaysia). I grew up mostly in the city of Kuala Lumpur. Since early childhood, I was delightfully drawn to reading any material on spirituality that I came across. I often explored various spiritual practices independently, making me the odd one out in the family. I even taught myself Sanskrit chants and mantras. It was not long before I decided to be a vegetarian. As a child, I was deeply inquisitive and contemplative on many spiritual and philosophical questions. My other pastimes were spending time caring for animals and roaming around especially in nature. I always felt a deep psychic connection amidst nature. At the age of 15, I stumbled upon the Bhagavad Gita and it marked the beginning of a new journey in my life. I became much more conversant in Yogic spirituality and its methods. During those days, I dedicated almost every single day to the study of the Bhagavad Gita – a text that I continue to study for over 20 years with many teachers apart from my own self-study. Overtime I was drawn to the outstanding reasoning and logics of the Advaita Vedanta wisdom tradition. It deeply resonated with my own being and search for clarity. I particularly admired very much the ideas put forth by the great 8th century philosopher-saint Adi Shankara. Around the age of 20, I became acquainted with the books written by the world-renowned yogi, Swami Sivananda - the founder of the Divine Life Society which is headquartered in Rishikesh, India. Inspired by Swami Sivananda’s writings I took up various yoga practices, engaged in social services and eventually I started conducting Yoga classes in the ashram for the public. I also taught Vedic spirituality and personal growth to youngsters. I excelled in school and went to university to study Computer Science. There I obtained a degree in Software Engineering. I graduated with First-Class honours and multiple excellence awards including a lifetime membership of the Golden Key International Honour Society and an AIESEC student nominee. Later on, I joined the Central Bank of Malaysia as a Senior Executive. From a very young age, I always felt the need to put aside everything and spend a period of my life in total dedication to comprehensively study the ancient Vedic scriptures from expert spiritual masters. My yearning for a thorough knowledge of the Vedic scriptures and more importantly for Self-knowledge and personal spiritual experience grew day by day, until it became unbearable to continue life as it is. One day I came across Swami Chinmayananda’s commentary of the Bhagavad Gita. Swami Chinmayananda’s rational and analytical presentation delighted and inspired me. Perhaps not surprisingly, it was instrumental in nudging me forward to finally decide to leave everything – my family, friends, relationship and all activities including my job at the Central Bank and head to India. 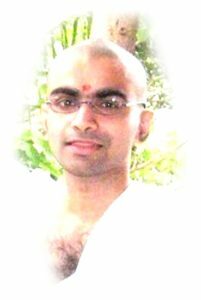 So after a few years of having a career in the corporate world, I resigned and left for India to study Vedic philosophy and spirituality in 2008. I first attended the Sandeepany Sadhanalaya Mumbai – the famous Institute of Vedantic studies founded by Swami Chinmayananda. I was basically going through strict studies and trainings that are commonly expected of the monks associated to the great Adi Shankara’s monastic order. Here I was taught principally by Swami Advaitananda and a few other teachers as well. Later on, I moved to the ancient city of Varanasi and there under the personal mentorship of Swami Chidananda (author, International speaker and founder of FOWAI Forum), I studied the Bhagavad Gita and dived deep into the principles of Advaita (non-duality) and Atma-Jnana (Self-knowledge). There my teacher guided me out of many lingering doubts concerning Self-knowledge that had trouble me for a long time. Also in Varanasi I studied Sanskrit from my teacher Prithviraj Singh. I travelled to many places in India to attend courses and meet scholars. There were many brief learning experiences on the journey. Once I stayed in Pondicherry and took lessons in the science of Sanskrit-root sounds and metres from Dr. Sampadananda Mishra, a highly respected Sanskrit scholar, researcher and author associated to the Sri Aurobindo Ashram. Another memorable meeting that made a lasting impression on me was in Bangalore with Dr. R.L. Kashyap, a scientist who contributed in the field of applied mathematics and pattern recognition and the renowned author of the English translations of the Vedas. Another notable period was in Mysore, where for many months, I advanced my studies in Sanskrit grammar in a traditional gurukula under the expert guidance of my sagely teacher, Jagannatha Acharya. On the last leg of my journey, I retired to Sri Ramana Ashram, at the foothills of Mt. Arunachala where I spent time in meditation before returning home to Malaysia. In 2012, I earned a Master’s Degree (M.A.) in Sanskrit (Sanskrit literature and philosophies) from the Karnataka State Open University in India. Throughout my life, I always kept an open and patient attitude towards learning, attach importance to independent thinking, mindfully detach from rigidity and dogma and embolden myself to explore new experiences even if I had to embrace vulnerable situations. My thoughts evolved through contacts with the teachings of many spiritual teachers and philosophers and I am grateful to all of them. However the teachings of Sri Ramana Maharshi and Sri Nisargadatta Maharaj have had the most prominent influence on me personally and continue to do so in my work today. After returning back from India, I started giving talks, classes, workshops and personal consultations and eventually developed the work that I am doing through this website.